BOTOX Cosmetic® is an approved, safe prescription drug which is used to reduce or minimize facial wrinkles in the area(s) it is applied. The treatment involves very tiny injections into the muscles under the skin in order to temporarily relax the muscles. This will prevent the muscles from fully contracting, and thus will minimize the creasing / folding / wrinkling of the skin in the treated area. The treatment is temporary and not permanent. Dr. Stan Heinrichs strives to achieve a natural outcome in conjunction with the patient’s treatment goals. BOTOX Cosmetic® will relax the muscles which contract and thus it helps to soften or reduce the wrinkling typically associated with negative expressions such as: worry, anger, stressed appearance, tired etc. You will still be able to express yourself and to smile. 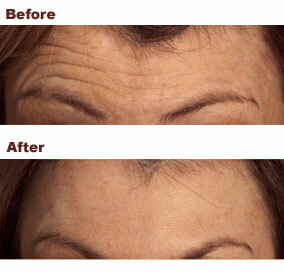 A BOTOX Cosmetic® treatment often results in a more relaxed, better rested and “fresher” appearance. Can Botox® get rid of all my wrinkles? The goal of treatment is NOT to completely immobilize the face and thus complete elimination of lines cannot be guaranteed. BOTOX Cosmetic® is applied by a few tiny injections into the area(s) discussed between Dr. Heinrichs and you, the patient. The needle used is very tiny and feels similar to tiny pinches. Anaesthetic is not required and the treatment only takes approximately 15 minutes to perform depending on the individual’s needs. How long does it take until I can see any results? You may start to see the results begin within a few days after the treatment, but full treatment results can take up to 14 days to fully set in. Please wait until 2 weeks has passed before assessing results. How long does the Botox® treatment last? Treatment results may last approximately 3 to 4 months BUT every patient is different due to everyone’s unique muscular structure. Thus, it is important to take note of the date when you begin to notice that your muscles start to regain their movement and thus, begin to create folding / wrinkling of the skin. If you are diligent about maintaining your BOTOX Cosmetic® treatments at the frequency recommended by the Doctor then you increase the ability of your treatment results to last longer after future treatments. Dr. Heinrichs charges by the number of units used during a treatment. The exact number of units used is decided by the Doctor after assessing the patient’s muscular structure and discussing the patient’s goals of treatment. Every patient is different and will require a different amount of product. If you are diligent and strictly adhere to the recommended treatment frequency schedule, you will be able to extend the treatment results and potentially reduce the amount of BOTOX Cosmetic® that you require. This treatment approach will reduce your overall treatment costs. Contact our office for your personal Botox aesthetic evaluation. Botox® focuses on relaxing the facial muscles to relieve wrinkles. Dr. Heinrichs will recommend the best possible treatment for you based on his assessment of the wrinkle issues and skin problems. Depending on your skin assessment.